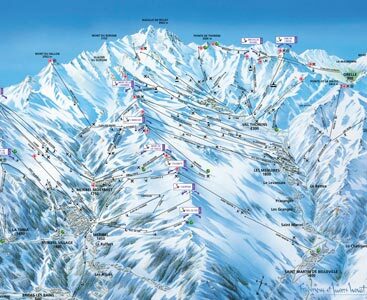 The Three Valleys rightly deserve the title of being one of the best ski areas in the world. This huge terrain, covering Méribel, Courchevel and Val Thorens, provides some of the most fantastic skiing in the Alps, with over 600km of runs; unrivalled lift systems; peaks rising to 3300m and over 550 snow cannons.In fact, one could easily argue that it is the best ski area in the world. 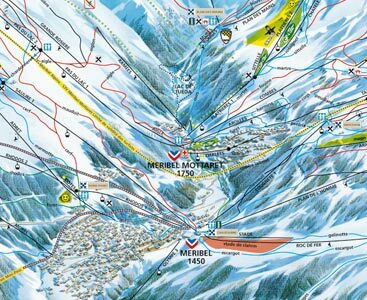 The Méribel valley sits in between the Courchevel and Val Thorens valleys and is a vast ski area in itself. There are gentle rolling greens and blues for beginners around the Altiport and beyond for beginners; miles of challenging reds in all directions for the intermediates and technical skier; couloirs for the experts; excellent off-piste for the experienced and two snow parks at Bartavelle for the more extreme. The lift system is one of the best in the world and is constantly being updated, making getting from one end of the Three Valleys to the next entirely possible in one morning. Gone are the days of long queues or freezing lifts. And for those who are partial to a good lunch, the Three Valleys are home to some of the finest and most varied mountain restaurants in the Alps. You’ll be hard pushed to explore the whole of this fantastic ski area in just one week, so you’ll just have to come back!